Mountain Retreat, Hiking, Waterfalls, Close to Everything! Nice place for the kids to have fun, especially in colder months. The view was absolutley incredible. Service and amenities were top notch. Where to find Green Mountain Falls hotels near an airport? Where can I find hotels in Green Mountain Falls that are near tourist attractions? 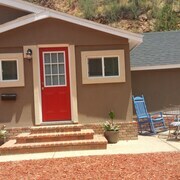 After accommodation options in Colorado Springs, specifically in Green Mountain Falls? The center of Green Mountain Falls offers 5 Expedia-listed hotels and apartments within a 0.1-kilometre (0.06-mile) radius. Hotels that aren't far from the city center of Green Mountain Falls include the Adobe Inn at Cascade and Eagle Fire Lodge & Cabins. 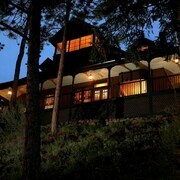 The The Broadmoor is 20 kilometres (14 miles) from the center of Green Mountain Falls. Alternatively, the Pikes Peak Paradise - Woodland Park is 9 kilometres (6 miles) away. 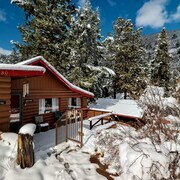 Two more Expedia-listed accommodation options include the Old Town GuestHouse and the Cheyenne Mountain Resort. If you plan to enjoy more of the mountains and foothills in this region of United States of America, you may choose to plan to spend time in other parts of Central Colorado. No matter if you join in with the common local activities, for example snowboarding, or simply travel around to explore the attractions, you will be able to find comfortable hotel accommodation in the area. Manitou Springs is 12 kilometres (8 miles) to the southeast of Green Mountain Falls and is where you'll find Manitou Springs Cave Dwellings and Pikes Peak Cog Railway. 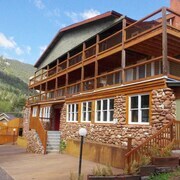 Expedia-listed Manitou Springs hotels and accommodations include the Cliff House at Pikes Peak and Comfort Inn. 18 kilometres (11 miles) to the east of Green Mountain Falls, you may also choose to stay at North Colorado Springs, home to the Staybridge Suites Co Springs-Air Force Academy and Holiday Inn Express Hotel & Suites Co Springs-Air Force Acad. The Trampoline World Gymnastics and Mr. Biggs Family Fun Center are popular sites to see when visiting North Colorado Springs. Just because you're on vacation, doesn't mean you can't enjoy your passion for all things sport. Pepsi Center is 90 kilometres (56 miles) to the north of Green Mountain Falls. Those wishing to find a room or apartment close by can choose from the Four Seasons Hotel Denver or the The Ritz-Carlton, Denver. Situated 30 kilometres (19 miles) from Green Mountain Falls is City Of Colorado Springs Muni Airport. Stay nearby at Homewood Suites Colorado Springs Airport or Radisson Hotel Colorado Springs Airport. What are the most popular Green Mountain Falls hotels? Are there hotels in other cities near Green Mountain Falls? 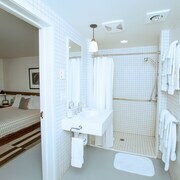 What other types of accommodations are available in Green Mountain Falls? Explore Green Mountain Falls with Expedia.ca’s Travel Guides to find the best flights, cars, holiday packages and more!